Challenging traditional approaches to migration, which see migrants in narrow categories (legal and illegal, newcomer and settler), this title shows that migrants and refugees live in transit for years, a stage in the migration course profoundly affecting destination countries an... read full description below. This book is about the phenomenon of transit migration to Europe, and its impact on states and people.This book presets topical subject: the issue is politicized and mediatized. It combines new research data with an originality in approach: both top-down and bottom-up. 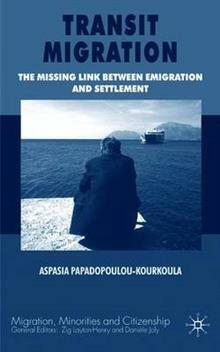 It focuses inside and outside Europe.Challenging traditional approaches to migration, which see migrants in narrow categories (legal and illegal, newcomer and settler), Transit Migration shows that migrants and refugees live in transit for years, a stage in the migration course profoundly affecting destination countries and the migrants themselves. ASPASIA PAPADOPOULOU-KOURKOULA has worked with the Global Commission on International Migration, the UNHCR and local government and research centres in Europe. She has published on transit migration, irregular migration and asylum. She is currently employed by the European Commission as an expert on these issues.